Restoring Classic Arcade Games in Mini Cabinets! 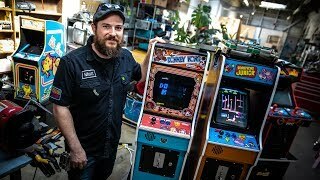 Matt Sengbusch builds unique arcade cabinets using components recovered and restored from classic arcade games. We visit his workshop to learn how he fixes game boards and designs these half-scale arcade cabinets to fit original parts like CRT monitors, coin slots, and full-sized controls. Learn more about the Small Change Arcade here: https:www.smallchangearcade.comShot by Gunther Kirsch and edited by Norman ChanSubscribe for more videos! http:www.youtube.comsubscription_c... Follow us on Twitter: http:www.twitter.comtestedcom Get updates on Facebook: http:www.facebook.comtestedcomTested is: Adam Savage http:www.twitter.comdonttrythis Norman Chan http:www.twitter.comnchan Simone Giertz http:www.twitter.comsimonegiertz Joey Fameli http:www.joeyfameli.com Gunther Kirsch https:guntherkirsch.com Ryan Kiser https:www.instagram.comryan.kiser Kishore Hari http:www.twitter.comsciencequiche Sean Charlesworth http:www.twitter.comcworthdynamics Jeremy Williams http:www.twitter.comjerware Kayte Sabicer https:www.instagram.comkaytesabicer Bill Doran https:twitter.comchinbeard Ariel Waldman http:www.twitter.comarielwaldman Darrell Maloney http:www.twitter.comthebrokennerd83 Kristen Lomasney https:twitter.comkrystynloIntro bumper by Abe Dieckman Set design by Danica Johnson http:www.twitter.comsaysdanica Set build by Asa Hillis http:www.asahillis.comThanks for watching! Enjoy this video from the Tested Premium video archive! Learn more at http:tested.commembershipAfter a few weeks working independently, Jeremy and Sean return to Other Ocean to meet with Mike and Kevin to check in each other's progress. Sean lays out a proposal for the design of the cabinet, and the shape of the software is starting to form!Shot and edited by Gunther KirschWatch the rest of this series right now! Consider joining the Tested Premium member community here: http:tested.commembershipEpisode 1: https:www.tested.compremium852029-bits-atoms-starlords-arcade-cabinet-part-1 Episode 2: https:www.tested.compremium853086-bits-atoms-starlords-arcade-cabinet-part-2 Episode 3: https:www.tested.compremium854136-bits-atoms-starlords-arcade-cabinet-part-3 Episode 4: https:www.tested.compremium855144-bits-atoms-starlords-pt-4 Episode 5: https:www.tested.compremium856575-bits-atoms-starlords-arcade-cabinet-part-5 Episode 6: https:www.tested.compremium858438-bits-atoms-starlords-arcade-cabinet-part-6 Episode 7: https:www.tested.compremium859491-bits-atoms-starlords-arcade-cabinet-part-7Subscribe for more videos! http:www.youtube.comsubscription_c... Follow us on Twitter: http:www.twitter.comtestedcom Get updates on Facebook: http:www.facebook.comtestedcomTested is: Adam Savage http:www.twitter.comdonttrythis Norman Chan http:www.twitter.comnchan Simone Giertz http:www.twitter.comsimonegiertz Joey Fameli http:www.joeyfameli.com Gunther Kirsch https:guntherkirsch.com Ryan Kiser https:www.instagram.comryan.kiser Kishore Hari http:www.twitter.comsciencequiche Sean Charlesworth http:www.twitter.comcworthdynamics Jeremy Williams http:www.twitter.comjerware Kayte Sabicer https:www.instagram.comkaytesabicer Bill Doran https:twitter.comchinbeard Ariel Waldman http:www.twitter.comarielwaldman Darrell Maloney http:www.twitter.comthebrokennerd83 Kristen Lomasney https:twitter.comkrystynloIntro bumper by Abe Dieckman Set design by Danica Johnson http:www.twitter.comsaysdanica Set build by Asa Hillis http:www.asahillis.comThanks for watching! I found this old vise pretty cheap and thought it would make an excellent restoration project as it swivels in two directions and is very heavy. Little did I know that it had a complete break in the main shaft with the front jaw snapped off! All is not lost though - I was still keen to try to give this old tool a new lease of life.Disclaimer: I am no welder and I don’t profess to be. From my research, I have read that it can be difficult to weld these back together. This will not be used under heavy applications and is not intended to be. I understand that at some point it could crack again. Support videos like this -- and get a free gift -- by becoming a Tested Premium Member: http:tested.commembership In Detroit, Adam stops by Jack White's Third Man Records, the first new record-pressing plant in the United States in three decades! In a truly immersive tour, Adam records his Brain Candy song and then follows his record's eventual process from lathe to cellophane. Bonus: Adam also chats with Jack White about how recording this way impacts the creative process!For more on Third Man Records, visit their site: https:thirdmanrecords.comProduced by Kristen Lomasney Shot by Burke Doeren and Tyson Call Edited by Mark Petro Audio by Aaron EschenburgSubscribe for more videos! http:www.youtube.comsubscription_c... Follow us on Twitter: http:www.twitter.comtestedcom Get updates on Facebook: http:www.facebook.comtestedcomTested is: Adam Savage http:www.twitter.comdonttrythis Norman Chan http:www.twitter.comnchan Simone Giertz http:www.twitter.comsimonegiertz Joey Fameli http:www.twitter.comjoeyfameli Kishore Hari http:www.twitter.comsciencequiche Frank Ippolito http:www.twitter.comfrankippolito Sean Charlesworth http:www.twitter.comcworthdynamics Jeremy Williams http:www.twitter.comjerware Gunther Kirsch Ryan KiserThanks for watching! This model had been buried in a garden for at least 30 years when it was discovered and then sent to me. It was worse than I imagined. At first I thought this could not be saved but I took up the challenge. Very slowly, one part at a time, it started to transform. Eventually a small miracle occurred and it became a display worthy model which is now part of my collection.I'm back home now so I shall be back on schedule with my weekly uploads!Like what you see? - You can assist me with the costs associated with the production of these videos by a making a donation via this link. https:www.paypal.meMartysMakeovers.Patreon - https:www.patreon.comMartysmatchboxMakeovers Email - [email protected] Twitter - https:twitter.comMartysMatchboxMusic: 'Paradise' by Misael Gauna. Tour of Adam Savage s Cave! This is my third arcade machine that I ever built and it is bigger and better than anything I previously built. This bar-top arcade is going to a friend as a thank you gift. I ordered a Pandora's Box 4S arcade kit that came with joystick buttons, a Pandora's Box 4s, power supply, speakers, speaker covers, amplifier, coin slot, jamma cable, and cabinet lock. The kit was about $150 dollars and was purchased on Aliexpress. The T-molding was about $15 from ebay. The monitor was given to me by my friend. The angle aluminum was $7 from Home Depot. The marquee acrylic panel, LED light strip, and back panel was sourced from my own stock of left over parts.I'm most proud of the coin slots that are incorporated into the marquee panel. I got inspiration from the numerous cardboard coin sorter projects on Youtube and thought it would be a great idea to incorporate it into an arcade machine. The coin slots work using optical switches and a credit is registered when the optical switch is interrupted by the coin rolling through it. The chute will filter out coins that are of the wrong size so only quarters and larger will be registered as valid credits.This video is a step by step process of how I built the arcade machine and is broken down into the following sections: Introduction Stage 1: Design Stage 2: Drafting Stage 3: Cutting Stage 4: Mounting Blocks Stage 5: Test Assembly Stage 6: Mount Monitor Stage 7: Make Holes Stage 8: Routering Stage 9: Painting Stage 10: Assembly Stage 11: T-Molding Stage 12: Marquee Frame Stage 13: Joy Buttons Stage 14: Back Panel Stage 15: Coin Slots Stage 16: Wiring Stage 17: Marquee Lighting Final Stage: Play TestingThis project was started some time around June, it was finished around October after a long hiatus. The video took much longer to make as I had many things competing for my time but I'm happy that I was able to finish it. On to the next project! Adam Savage Meets Barnaby Dixon s Puppets! Support videos like this -- and get a free gift -- by becoming a Tested Premium Member: http:tested.commembership Adam Savage welcomes puppeteer and animator Barnaby Dixon to the cave! We're big fans of Barnaby's inventive puppet design and puppeteering style, and he shares a few of his creations and shows how he brings them to life!Watch more of Barnaby's videos here! https:www.youtube.comchannelUCxseO_JzIiiJENauW2RmcJQGet Adam's T-shirt here: https:cottonbureau.comproductssavage-aeronautics-and-space-administrationShot by Gunther Kirsch and edited by Norman ChanSubscribe for more videos! http:www.youtube.comsubscription_center?add_user=testedcom Follow us on Twitter: http:www.twitter.comtestedcom Get updates on Facebook: http:www.facebook.comtestedcomTested is: Adam Savage http:www.twitter.comdonttrythis Norman Chan http:www.twitter.comnchan Simone Giertz http:www.twitter.comsimonegiertz Joey Fameli http:www.joeyfameli.com Gunther Kirsch https:guntherkirsch.com Ryan Kiser https:www.instagram.comryan.kiser Kishore Hari http:www.twitter.comsciencequiche Sean Charlesworth http:www.twitter.comcworthdynamics Jeremy Williams http:www.twitter.comjerware Kayte Sabicer https:twitter.comkaytesabicer Bill Doran https:twitter.comchinbeard Ariel Waldman http:www.twitter.comarielwaldman Darrell Maloney http:www.twitter.comthebrokennerd83 Kristen Lomasney https:twitter.comkrystynloIntro bumper by Abe Dieckman Set design by Danica Johnson http:www.twitter.comsaysdanica Set build by Asa Hillis http:www.asahillis.comThanks for watching! In this video I show how to successfully write a 2532A EPROM on a GQ-4x4 USB Programmer to modify an original Ms. Pac-man PCB to Fast Mode. I also show some of the unique features of my 40% scale Ms. Pac-man cabinet with hand painted side art and inlayed acrylic window (hand cut and reverse painted graphics).